We’re busting at the seams and making more room for servicing and working on vehicles. Lots of stuff for VW, Audi, Porsche, BMW and Mercedes Benz. Free for all! Want to bring some stuff to sell. BYO Parts, tools and equipment. You get a 16′ x 8′ parking space to put what ever you want in it. Cars for sale, parts, tools what ever. Add both days for 2 day of swap. Click here to reserve your spot today. Only 10 spaces available. Mk2 VW GLI Recaro Trophy Office chair (electric version) Can be swapped into a car. (Right) $250. Air Lift 3P Air ride kit for Mk6 Jetta (IRS) / GTI – Ready to install, trunk mounted already to just put in the trunk. Carpeted and mounted tank / compressor / and manifold ready to go. Nice trunk setup. Dual Air Zenith OB2 Compressors, Powder coated tank red, with leather tank upholstery. Retail $4000 Asking $2000 obo. Used for approx. 5000 miles. Jet Mill JTM-1054R Knee Mill w/ Acurite DRO- Very little use. Comes with tooling, X, Y & Z power feed, rotary table, vice, Angle table, T bolt kit, Coaxial indicator Set, entire R8 collet set, 1,2,3 blocks, 2 sets of vice jaw plates 1/8″ & 1/4″, R8 quick chuck, end mills, drill bits and a lot of more items. Retailed with tooling over $25,000, Asking $12,000. Wheel Boxes / Moving boxes – many w/ handles – Free! Air Zenith Reconditioned Air Compressors – 1/2 off!!! 16″ staggered DP Motorsport Wheels 5×108 1980s Ferrari Testarossa Fitment – could fit others: VOLVO, JAGUAR, FORD, LINCOLN, MERCURY, PEUGEOT, DODGE, AMC EAGLE, LAND ROVER and OLDSMOBILE vehicles. 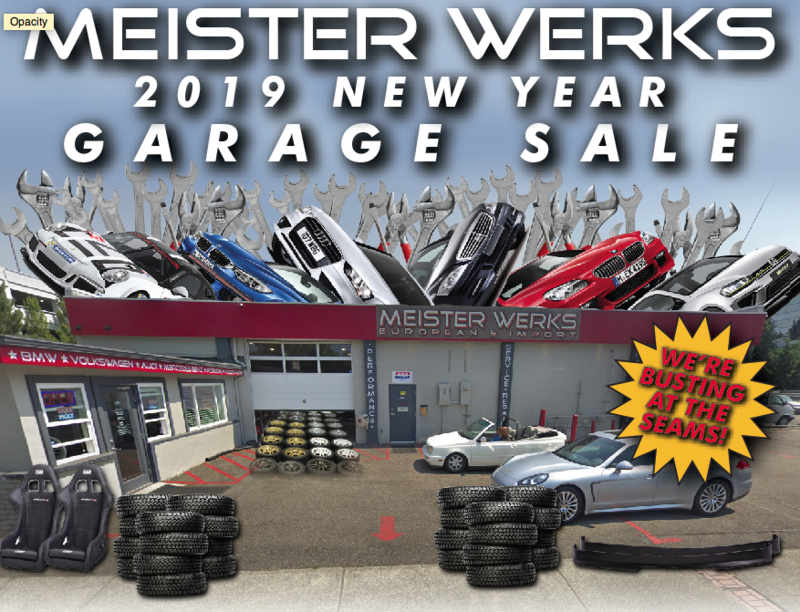 Free oil change and alignment giveaways and more! Liqui Moly Injector cleaner and More! 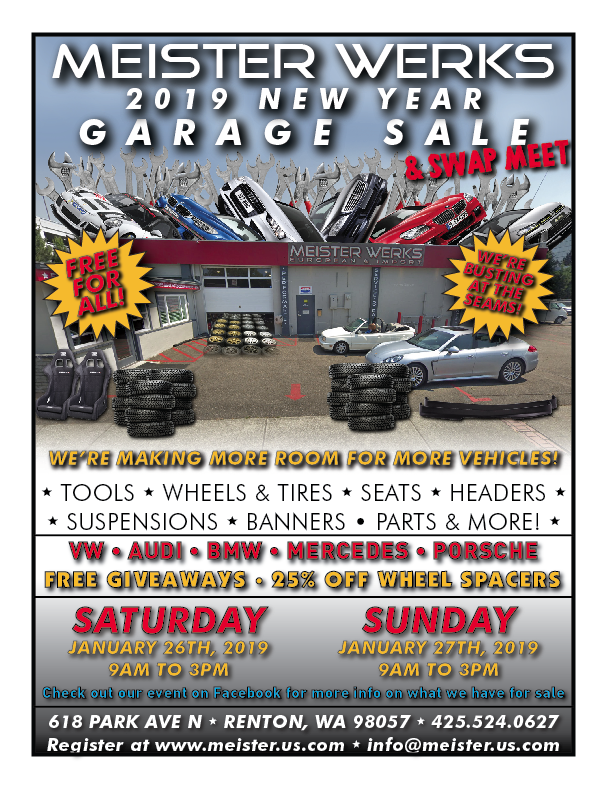 Come down on Saturday Jan 26th and Sunday Jan 27th, 2019, 9am – 3pm – Both Days! We will have much more than this for sale. VW Scirocco Brake Upgrade Need to contact us for a repair after hours?